There was never a quiet moment on Purim at the Friendship Circle of Brooklyn! Rabbi Berel and Chani Majesky worked round the clock to ensure a fantastic, amazing, and happy Purim for all the FC families. Families of children with special needs were invited to a tropical-themed Purim adventure with the Friendship Circle on Purim day. At the party, attendants listened to Megillah, enjoyed fun and colorful treats, and laughed along with exciting tropical entertainment! The doors opened and everyone was transported to a far off tropical island. The room was carefully decorated to match a vibrant tropical theme. Tables at the side sported an array of colorful treats, including Hamantaschen with many different fillings. Funny hats and tropical masks were available near the photo booth to add a little extra something to everyone’s photos. To see everyone as they walked in with their creative costumes was such a treat! Tropical island vacationers, superheroes, a pineapple costume, and more, were all present. Everyone settled down, and Rabbi Shimon Sabol read the Megilla. Then, it was time for the featured entertainer – the Parrot Rebbe! The Parrot Rebbe, a comedian and entertainer from Monsey, brought a menagerie of colorful parrots and other birds to aid in his performance. 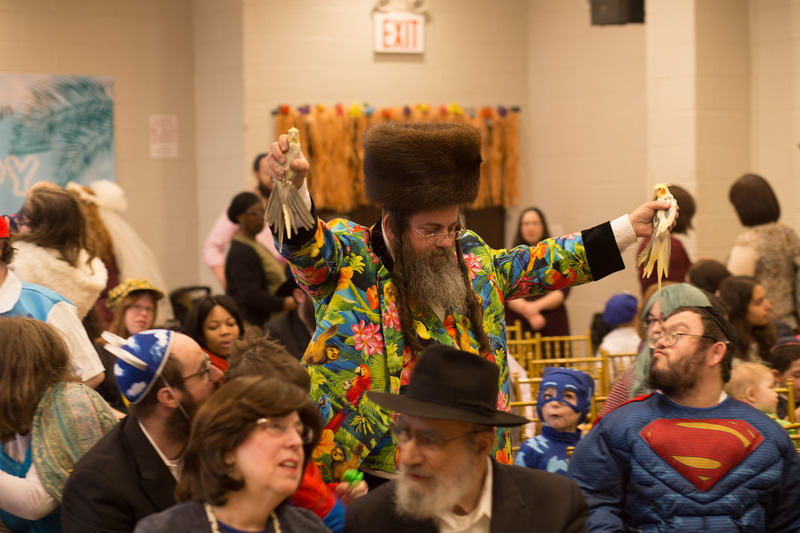 Wearing a colorful robe, the Parrot Rebbe slowly introduced the audience to his “Chassidim,” colorful parrots and birds from many different parts of the world! The crowd cheered on as two small birds raced to the top of a ladder, hoping for their team’s bird to win! Next, the Parrot Rebbe brought out his larger parrots and everyone held their breath as the majestic birds flew in a wide circle around the room. At the end of his performance, the Parrot Rebbe gave everyone a chance to hold the beautiful birds. Everyone left the Purim party with light feet and happy hearts – ready to fulfill the rest of the Mitzvos of Purim! But Simchas Purim for families of Friendship Circle Brooklyn didn’t end there. In addition to the festive party on Purim day, Friendship Circle hosted a Megillah reading in their Social and Sensory Space on Purim night. Bochurim were sent out to read the Megillah to 11 homebound families. 150 Shalach Manos were sent to Friendship Circle’s volunteers; 390 gifts and Purim cards were sent to FC partners; 24 students from Lamplighters Yeshiva delivered Shalach Manos to children with special needs; and over 27 volunteers visited their special friends on Purim day! Thank you to Rabbi and Mrs. Berel and Chani Majesky, directors of Friendship Circle of Brooklyn, for organizing a fun-filled Purim for all! Thank you to Mushki Tenenbaum and Esther Begun for organizing the Purim party, and to all the volunteers who came to help set up! Thank you to Rabbis Shimon Sabol and Sholly Weiser for leining Megillah, the Schapiro boys for reading Megillah at people’s homes, to Lamplighters for partnering in the Uplift Shalach Manos program, and to all the FC volunteers!